Demolishing the Hollywood concept of the holiday film while Four Christmases tears up the North American box office, Arnaud Desplechin’s Un Conte de Noel is a film both intimate and epic, in which the titular holiday works more as an excuse to draw seemingly dozens of plot threads under a single roof. The film acts as a corrective to Tinseltown’s tinsel tales not only due to the lack of sentimentality ascribed to the season, but because of the way it subverts any number of family-dysfunction clichés. The family in question is the Vuillards, whose feisty, steadfast matriarch Junon (Catherine Deneuve) has been diagnosed with lymphoma, the same disease that claimed her firstborn son Joseph at age four. Husband Abel (Jean-Paul Rousillon) seems to take it in stride, but uses her illness and the coming holiday as a springboard to unite their long-fractured family. At the heart of much of this discord is the rift between their daughter Elizabeth (Anne Cosigny) and their misfit second son Henri (Mathieu Amalric of The Diving Bell and the Butterfly and Quantum of Solace, running away with the movie). Meanwhile, Elizabeth’s teenage son Paul (Emile Berling) has grown stricken with depression, and Junon’s youngest son Ivan (Melvil Poupad) lives in seeming familial bliss with his beautiful wife Sylvia (Chiara Mastroianni, real-life daughter of Deneuve and Marcello Mastroianni) while a secret about their courtship lingers in the periphery. If the plot sounds crowded, it is, but Desplechin, who also co-penned the script with Emmanuel Bourdieu, finds ways around the convolution, from shadow puppets to first-person asides, dispensed sparingly enough and in such a natural style that it never feels as though he’s broken with his format and never reeks of gimmickry. Desplechin’s greatest strengths, however, lie in his matter-of-factly approach to the family’s troubles and his stellar casting. So many familiar tropes are trotted out – grief over long-lost relatives, terminal illness, sibling rivalry and jealousy – but they’re handled in such a natural, offhand fashion that the conflicts that arise never feel forced, and are never forced into clean resolution. Deneuve of course holds her own, but it’s the supporting cast that truly shines, especially the aforementioned Amalric and Cosigny, as well as Amalric’s slightly mischievous lover Faunia, played by Emmanuelle Devos, acting as a shot of levity for much of the film’s back half. 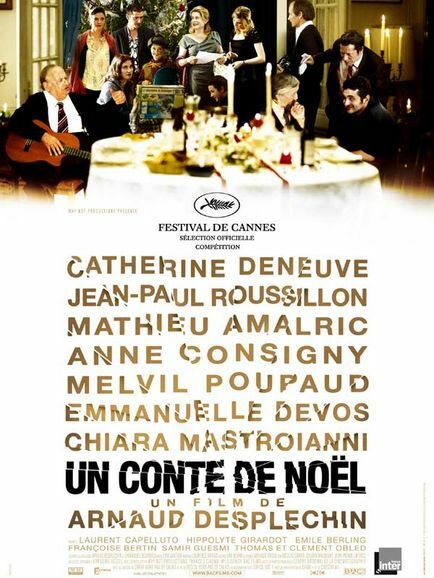 Evoking Wes Anderson’s The Royal Tenenbaums in structure and tone but feeling much more authentic as an emotional document of a family in flux, Un Conte de Noel stands as one of the year’s best ensemble efforts and as a reaffirmation of the singularity of France’s best cinema.